Electric locomotive 1116 202 Railjet of the Austrian Federal Railways. Model Description: Motor with flywheel. Drive on all four axles, two of them have traction tyres. 3 pantographs. NEM 362 coupler pocket and close coupling mechanism. White/red triple LED headlights with in digital mode switchable high beams. Also equipped with separately switchable headlights and tail light. Digitally switchable sound functions. PluX22 Interface. The model is equipped with digitally switchable sound functions and Roco bow coupling. The model is equipped with a built-in video camera. The video image is directly transferred to a smartphone or a tablet PC via a built-in WiFi Locomotive chip. 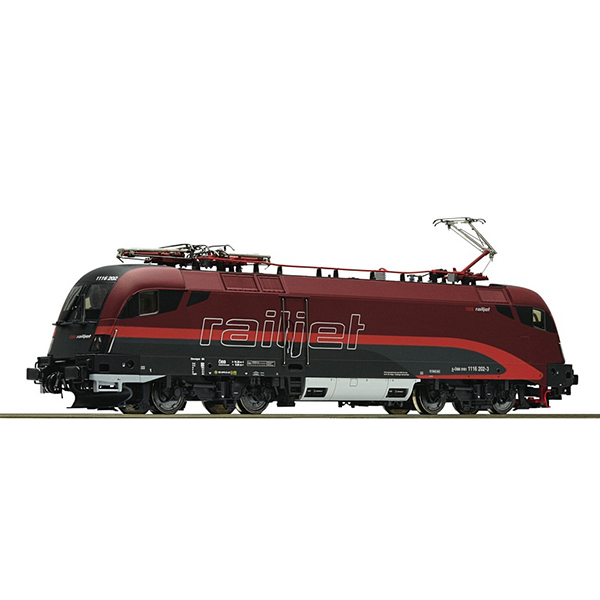 Suitable items to compose a "Railjet" train: 64178 and 64181.